Opening a MIELE Bloomest self-service laundry is ultra simple. The Bloomest team will guide you 100% in applying all the rules needed for the certain success of your self-service coin laundry. With just a few, easy steps you can launch your new business and become your own boss. As soon as the project is approved, work will begin and will be coordinated by the Bloomest construction manager. During this phase, you can take advantage of the training courses and Tutor made available by Bloomest for new managers. All of this comes with the guarantee of Italy’s leading self-service laundry company and the quality of MIELE machines. What are you waiting for?! Contact us right now! Opening a Bloomest self-service laundry means becoming part of an exclusive club that provides you with a team of professionals and tools for rapid and certain success. Opening a Bloomest self-service laundry means being able to rely upon the excellence of MIELE machines. MIELE’s German technology is a point of reference that offers REASSURANCE to entrepreneurs and is a GUARANTEE for final customers. The Bloomest shop is a welcoming and pleasant environment both for customers and the owner. A simple, minimalist design creates an informal space where the operating areas are easily visible and information is clear. Thanks to the exclusive MIELE honeycomb drum and the special programs that make it possible to achieve very reliable excellent washing results for every type of laundry: from delicate silk and wool garments to hard-to-clean items, like down comforters, windbreakers and work clothes. MIELE washing machines automatically dispense detergents, sanitizers and fabric softeners. Customers only need to select and start the best washing program for their garments. To achieve unbeatable washing results BLOOMESTuses professional detergents specifically developed by MIELE to sanitize, wash and soften every type of garment. MIELE Sanyplus® sanitizer is automatically dispensed at every wash cycle, ensuring safety and hygiene. 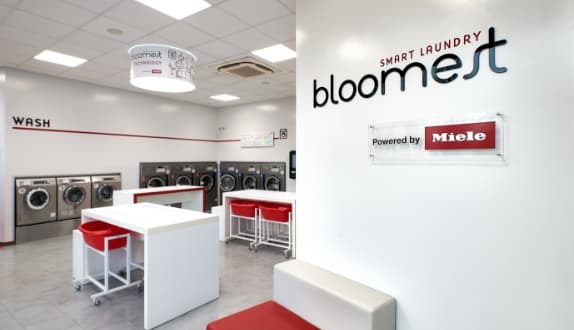 Right from the design of your self-service laundry and throughout the management of your retail location and communication and promotion activities, Bloomest will always be at your side. The BLOOMEST ACADEMY programme includes several professional training courses. THE OPERATING MANUAL, provided to new managers, is a fundamental guide with all of the technical information and advice for the proper functioning and maintenance of the systems as well as management advice. In addition, you will have access to the BLOOMEST MASTER manual to guide and orient you as you make the most important choices and decisions so you will consistently achieve the best results. Based on the available space and the number of users expected it is possible to easily plan out a modular system with washers and dryers of various capacities and workloads. Along with its unbeatable reliability, MIELE guarantees excellent, ongoing, on-site assistance. In addition, its machines are backed by an integrated 24-month warranty.